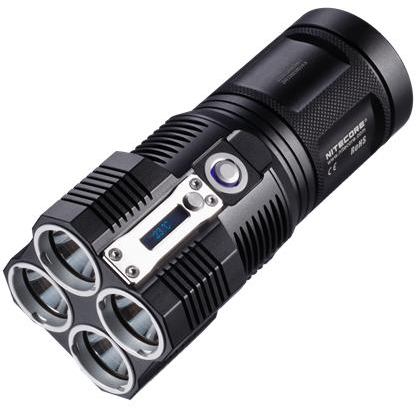 This 3800 lumen bad boy is more powerful than the average 8inch LED light bar and 10 times more powerful than your average LED camping lantern from just 4 LED’s. The TM26 is constructed from “aerospace grade” aluminium alloy, because Nitecore know you are likely to mistake it for the sun and toss it back into space. They have also “HAIII Military Graded” it since the US Army changed the TM26 into their sole weapon of choice. Updated tactics include burning through enemies with the light sabre qualities, or just bludgeoning them to death with it. For the average non-military personnel though you may simply appreciate features such as a battery life ranging from 1000 hours on low, to 45 minutes on maximum. The handy lcd screen tells you the temperature of the torch (LED’s don’t enjoy heat), light setting, battery charge/voltage and run time remaining. And of course the sheer light output of this beast will quickly settle the argument of who has the bigger….well…ahem!…..It is waterproof as well, although only to a depth of two metres. Guess it’s better than nothing! What’s it gonna set you back? Somewhere between 370 and 500 Aussie dollars with a bit of Google searching. You can read more about the light HERE.